“Dear America, remember that astronaut we killed and had a really nice funeral for? Turns out he’s alive, and we left him on Mars. I hope NASA draws its conclusions after watching this film. Namely rearranging their budget. First, they can scrap these expensive looking airlocks and replace them by locks made of cellophane which is attached with use of duct tape. Now they can use that extra budget for a reserve communication system in the base station so that any abandoned crewmember can still contact the control center in Houston if the initial one fails. They would hear for the first time: “Houston, I have a problem“. That was the first thing that flashed through my mind after watching this otherwise smashing great SF, created by the unsurpassed, “my all time favorite” brilliant director Ridley Scott. The (for me) blatant misstep “Exodus“, is hereby forgiven. Mars is hot. Not literally, of course. But the recent revelations of NASA about flowing water and solar storms that changed Mars into a cold, dry planet, made sure Mars came to be the center of attention. It’s not really science fiction anymore, because there are plans already to built settlements on Mars around 2023. Contrary to what’s shown in “The Martian“, these settlers will depart with a “one way ticket”. Best those volunteers say goodbye thoroughly because their final destination is the local crematorium on Mars. Initially this wouldn’t happen with the scientists in “The Martian“. Until there’s a terrible storm showing up which forces them to pack their bags and catapult themselves from this red planet. But they weren’t expecting debris flying around, causing Mark Watney (Matt Damon) to be impaled like a delicious souvlaki. And then he sits there alone on that damn planet, light years away from his home planet. Remi on Mars. Or the new Robinson Crusoe. But this time without an ocean. 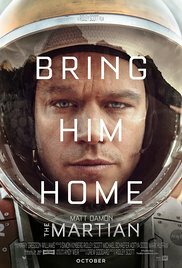 Matt Damon apparently prefers to play the stranded space traveler, since he also did that in “Interstellar“. The big difference with “Interstellar” lies in the scientific accuracy. The solutions Mark comes up with to survive and the circumstances on Mars, are theoretically possible (only the devastating storm at the beginning is fiction). This in contrast with “Interstellar” where everything is based on theories which aren’t tested in reality. We know about “black holes”. They are kind of interstellar hatches. But we still don’t know for sure where you end up, after tumbling in such a hole, and what effect it has on time. I guess this is still a mystery. Sadly enough, “The Martian” also has some points of comparison with “Gravity“, that other space-epos that turns into a survival trip avant la lettre. Just like in that movie, the setbacks follow in rapid succession. The only difference, in “Gravity” it’s grossly exaggerated. What I liked the most was the perfect balance between scientific gibberish, the tension and the perfectly dosed humorous moments. The scientific part was even for a layman like myself perfectly apprehendable. Partly thanks to the sometimes reliable explanations from the videolog which Mark kept from day one. Needless to say the film is filled with nerve-racking, exciting moments. But especially the comic moments made this an enjoyable film. A perfect task for Matt Damon with his charming, boyish smile who solves every problem with a casual quip and a dose of positivism and perspective. Even the control center of NASA, which is filled to the brim with humorless, serious science nerds, made me smile from time to time. I never thought that the combination of queery disco music, old episodes of “Happy Days” and aluminum-wrapped human excrements, could amuse me. Money wasn’t an issue for making this blitz film. Not only is this demonstrated by the used images, but also by the starcast. Besides Damon there’s also Jeff “Dumb and Dumber“ Daniels, Sean “Boromir“ Bean, Chiwetel “12 Years a Slave“ Ejiofor, Jessica “Interstellar“ Chastain and Sebastian “Winter Soldier“ Stan. Each and everyone performs brilliantly. And furthermore, the images of space, the landscape of Mars and the spacecrafts are beautifully portrayed. Sadly enough at the apotheosis, the MacGyver-level was extremely high. Let’s hope that the Soviet Union isn’t offended in their honor because the Chinese salvaged the situation. Fortunately we were spared from a mass of waving American flags in the end. But despite the “We love NASA” and “We will prevail” atmosphere, this was a superb movie, worth a rewatch. A top survival drama.